Car window glass is vital to the insulation, light, visibility, aerodynamics and comfort of your vehicle. Some vehicles have two windows, others have up to six or more. Sustaining damage to even one window in a vehicle can greatly affect your vehicle’s gas mileage, the control you have over the vehicle’s internal temperature, and of course the amount of extraneous outside noise that slips into the car. 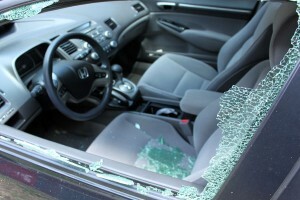 Unfortunately, damage to your car windows can happen for a number of reasons. Firearms, baseball bats, utility knives and other objects are often used to bust car windows to steal the vehicle, or steal something inside of the vehicle. Side impact collisions are the second most common type of accident in the United States, often causing sidelites and quarter panels to buckle and crack. Rear impact collisions are accountable for 29% of all accidents in the United States, and often lead to the rear window being damaged or to completely shatter. Random and unusual accidents can happen to car windows… Such as a stray athletic ball hitting the glass at just the right angle and speed. The neighborhood kids certainly didn’t mean it, but sometimes things like this happen. Car window glass can also be damaged by acts of nature. This includes a tree branch falling into the window, high winds whipping debris or stones at the glass, or extreme storms. No matter what causes the damage, getting your car windows repaired or replaced is a top priority for your driving safety.